Keith Curle believes squaring up to promotion-chasing Mansfield Town gives him and his players a great chance see exactly how they measure up against the Sky Bet League Two elite. And how far the Cobblers are going to have to go to match the Stags’ achievements next season. 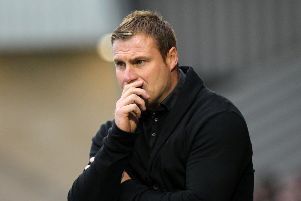 David Flitcroft’s team currently have the slightest of edges in a four-way battle for the remaining two automatic promotion spots behind champions-elect Lincoln City. They are second on goal difference from Milton Keynes, a point clear of fourth-placed Bury and four better off than fifth-placed Tranmere Rovers. It is going to be tight, but the Stags are in pole position going into the game with mid-table Town on Saturday, and Curle, a former Mansfield boss, is a fan of the Field Mill side. “I think this is a great opportunity for ourselves to compete this season against a team that are vying for automatic promotion,” said the Cobblers manager. “They are where we need to be. “So it is a great opportunity for us to go and test ourselves and see what gaps we need to bridge. Mansfield’s main man in attack is Nottingham Forest loanee Tyler Walker, who has 20 goals to his name this season. And although Curle knows his players will have to be wary of the son of former England defender Des Walker, he knows that Mansfield - who will have a travelling army of more than 1,400 supporters backing them on Saturday - have other threats as well. “Tyler Walker is a real threat,” said Curle. “He has great pace, great energy and is very direct. “He is enjoying his football and is somebody we need to pay attention to, but they have other players who can score goals in their team. “I know a few of their players, I have managed a few of their players, and there are a few players I have previously tried signing as well. “I have been to watch a couple of their games as well, and there has been a big change at that football club. “Credit to the chairman for his involvement in how he is structuring the club’s development, and it is paying off on the pitch. The most recent occasion the two clubs met, Mansfield were rampant as they raced to a 4-0 win at Field Mill in September. The result proved to be very significant, as it led to the sacking of Town boss Dean Austin, with Curle replacing him a couple of days later. David Buchanan says the Cobblers ‘owe’ Mansfield one for that embarrassing afternoon, but Curle insists this weekend’s game isn’t about revenge. It is simply about taking three points from a Stags team he insists is ‘beatable’. “We owe everybody that we play against, and that is the mentality we have to have,” said the Town boss. “We have to have the mentality in the changing room that we want to beat everybody, whether that is because of previous results or anything else. “We need the mentality that everybody is beatable in this division, and Mansfield are beatable. “We need to make sure that on the day we pay good attention to our roles and responsibilities and we play the game how we need to play it.